The feast of the Annunciation of the Virgin Mary is a feast of the Lord and of the Mother of God (Theotokos). It is a feast of the Lord because Christ who was conceived in the womb of the Theotokos. It is a feast of the Theotokos because it refers to the person who aided in the conception and Incarnation of the Word of God, that is, the All-Holy Virgin Mary. The conception of Christ occurred by the All-Holy Spirit in the womb of the Theotokos creatively and not by seed, because Christ had to undertake the pure nature that Adam had before the transgression. Of course, Christ adopted a possible and mortal flesh, as it became after Adam's transgression, to defeat corruption and death, but it was however utterly pure and spotless, as it was prior to the transgression. Thus, Christ's flesh from a viewpoint of purity was as Adam's body was prior to the transgression, while from a viewpoint of mortality and corruption it was the body of Adam after the transgression. 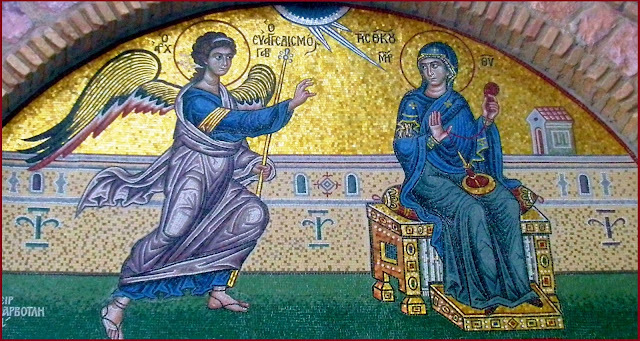 Saint Nikodemos the Haghiorite, speaking of the Annunciation of the Theotokos proceeds to a personal and existential approach of this event. Because, it does not suffice for us to celebrate only externally the events of the divine incarnation, but we should approach them existentially and spiritually. For this reason he gathered many passages of Saints in which mainly there is speech about this existential approach.